The Tokyo Monorail connects Tokyo to Haneda Airport. From Haneda Airport, travelers can ride the monorail to reach the popular Odaiba area easily, and also exchange currency quickly with English support inside the station. Picture from Get To Tokyo From Haneda Airport Simply - Train, Monorail, And Bus Guide! Haneda Airport is the gateway to Tokyo. The large number of flights from the European and Asian countries and its close location to the Tokyo metropolitan area make it a popular airport. This facility is a transportation hub, with domestic flights to popular sightseeing areas such as Hokkaido, Osaka, Hiroshima, and Fukuoka. Tokyo Monorail links Haneda Airport to the Tokyo metropolitan area. Frequent trains and a currency exchange center inside the station make this an ideal transportation choice. It is also convenient when visiting the Odaiba area, a popular sightseeing spot, with great views along the way. Tokyo Monorail runs between the domestic and international terminals of Haneda Airport and Hamamatsucho. The trains arrive in around four-minute intervals. From Haneda Airport International Terminal Station, which is connected to the terminal, passengers can reach the Monorail Hamamatsucho Station in thirteen to fifteen minutes by express train, and seventeen minutes by local train. The route map can be seen on the official site. Follow the signs to the monorail ticket gate from the second floor arrival lobby of the Haneda Airport International Terminal. The ticket machines have an English display, so visitors from abroad need not worry. The following are five benefits to using the Tokyo Monorail. The currency exchange booths in Haneda Airport tend to be crowded with customers waiting in line. 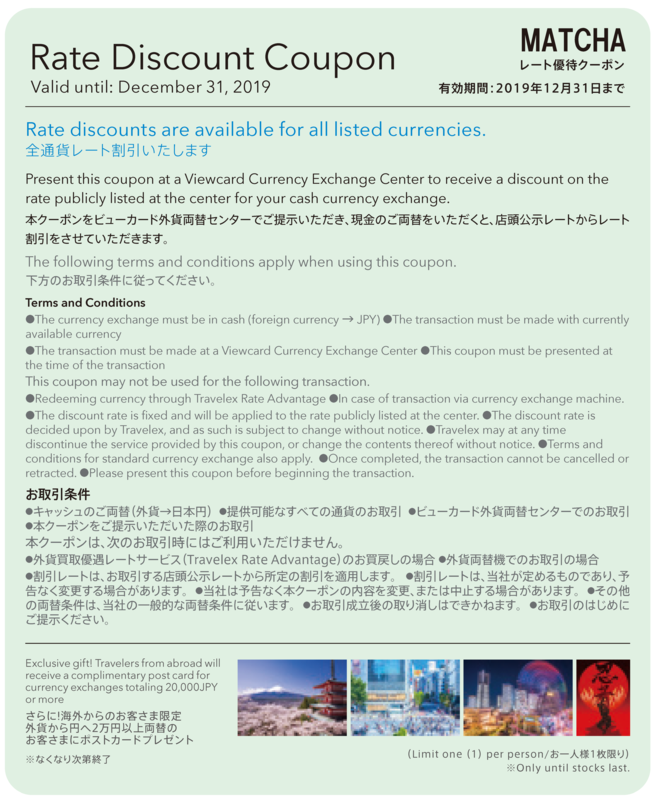 However, the Viewcard Currency Exchange Center, located inside Tokyo Monorail Haneda Airport International Terminal Station, is a convenient, less-known counter where travelers can exchange currency quickly and efficiently. Go through the monorail ticket gates, turn left, and take the elevator to the third floor. The currency exchange center is located in front of the elevator. The Viewcard Currency Exchange Center is a joint venture between Viewcard Co., Ltd., a JR East group company, and Travelex Japan, an international foreign currency exchange firm. The staff are all fluent in English, and there is no need to fill out lengthy paperwork (*1), so the exchange will be conducted quickly. MATCHA's readers receive a special discount on the excahnge rates by showing this coupon. *1: Please note that an application form, or identification papers might be necessary depending on the amount of exchange. With an exchange of more than 20,000 yen value of foreign currency, customers can choose from four postcard with Japanese landscapes such as cherry blossoms and Mt. Fuji. As the platform for trains heading for Hamamatsucho is on the other side, cross to the opposite side if you are boarding that train. Access The center is located inside the station. For further information on the Viewcard Currency Exchange Center, click here. Picture from Odaiba Travel Guide - 15 Must Do Things In Tokyo's Best Entertainment Spot! Odaiba is one of the most popular places to visit in Tokyo. Odaiba has large shopping malls like DECKS Tokyo Beach and Aqua City Odaiba. Diver City Tokyo Plaza, famous for the life-sized monument of Gundam, Rainbow Bridge, and Statue of Liberty are all fun spots great for photographs. From Haneda Airport, there are various routes to Odaiba, but the fastest route is using the Tokyo Monorail. Ride the monorail from Haneda Airport International Terminal Station to Tennozu Isle, switch to the Rinkai Line, and get off at Tokyo Teleport Station. The fare is 550 yen, and the ride takes about thirty minutes. Please note that it may take longer in the early morning hours and late at night. 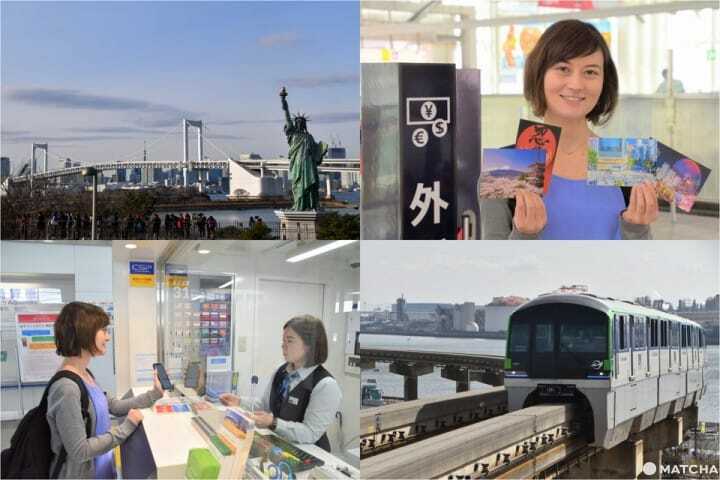 As of March 2019, Monorail and Odaiba Wakuwaku Ticket (Japanese), priced at 500 yen, can be purchased at the International Terminal Station, Terminal 1 and 2 Stations of the Haneda Airport. This ticket also allows discounts at restaurants and museums in Odaiba. For details, please check the pamphlet at the station. At Monorail Hamamatsucho Station, the last stop of the monorail, passengers can switch to the JR Yamanote Line, a loop line covering major Tokyo destinations, or the JR Keihin Tohoku Line, which runs from Yokohama to Saitama Prefecture. Transferring to the Toei Subway Asakusa Line, which goes to Asakusa, a popular sightseeing spot, or to Toei Subway Oedo Line, is also possible at this station. JAPAN RAIL PASS, which allows the user to ride JR trains including the Shinkansen, can be purchased (*2) at JR EAST Travel Service Center, located near the Minamiguchi (South Gate) of JR Hamamatsucho Station. The JAPAN RAIL PASS can also be purchased at another JR EAST Travel Service Center, located near the monorail ticket gates on the second floor of Haneda Airport. However, this spot is often has a long line of customers, while the Hamamatsucho center is less crowded. If the Haneda center is crowded we suggest using the Hamamatsucho center to make the exchange without a long wait. *2: There are certain requirements for purchasing the pass. For details, please check the official site. Toyosu Market, which moved from Tsukiji in 2018, is famous for the tour where visitors can watch the auction of seafood, vegetables, and fruits. It is a twenty-minute walk from the Ryutsu Center Station to Ota Market, another spot with a lively atmosphere. Visitors can also enjoy shopping and a waterside stroll at Tennozu Isle, located near Tennozu Isle Station. Anamori Inari Shrine close to Tenkubashi Station is known for sand that is said to ward off evil powers. *A small group can tour the market without a reservation. Many people may imagine Tokyo as a city filled with high-rise buildings, like Shinjuku or Shibuya. However, the picturesque waterside can be viewed from the monorail, with the high-rises in the background. The small boats and birds drifting on the water are a part of the charming, lesser-known views Tokyo offers. The Tokyo Monorail has other features as well. Passengers making a connection from an international flight to a domestic flight can use the monorail for free. Be sure to obtain a free ticket at the information counter in the airport terminal. A stop by the Viewcard Currency Exchange Center along the way should make the trip much easier. The monorail cars are furnished with a baggage compartment, which is a necessity for travelers carrying a large suitcase. If you plan to use the Haneda Airport, consider riding the Tokyo Monorail. Sponsored by Viewcard Co., Ltd.